The death mask of Daniel Good, executed outside Newgate prison on 23rd May, 1842, for the murder of his wife Jane Jones. It was thanks to delays in apprehending Good caused by communication problems that a dedicated detective was formed within the Metropolitan Police. 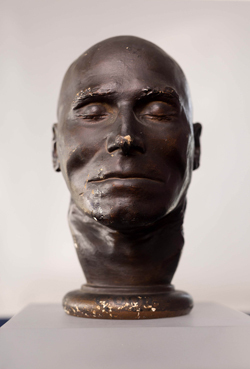 Good’s death mask is just one of the many items from the Metropolitan Police’s Crime Museum which will be on display at the Museum of London’s forthcoming exhibition, The Crime Museum Uncovered. Opening in October, the display will feature never-before-seen objects from the police museum which are usually only accessible to police professionals and their invited guests. Along with the death mask, other objects to be seen in the display will include a memoir by Donald Swanson, senior investigating officer on the investigation into the Jack the Ripper killings in the late 1880s, a pin cushion embroidered with human hair by Annie Parker, who died in 1879 after having been arrested more than 400 times for alcohol-related offences, and ‘microdots’ containing secret messages along with a microdot reader founder in Mrs Helen Kroger’s handbag when she was arrested for involvement in the Portland Soviet Spy Ring in 1961. The exhibition will run from 9th October to 10th April, 2016. Admission charges apply. For more, see www.museumoflondon.org.uk.